celebrate and embrace your history. Your purchase will show you are on Queen Calafia's team. what better way to show empowerment by wearing it fashionably? The confederates lost. america won. California should reflect accuracy. 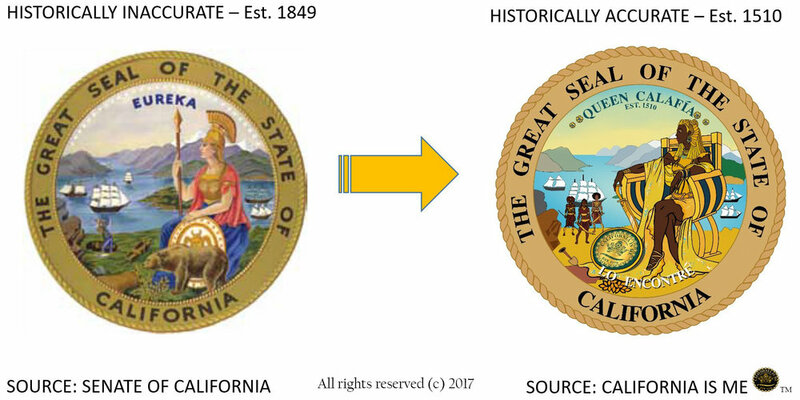 the fact is queen Calafia is the namesake of the state and is not officialized anywhere. sign petition FOR THE SLAVES THAT COULDN'T VOTE TO BE INCLUDED IN THEIR OWN HISTORY and if you want to feel empowered, act. see Twitter or Facebook (see links at bottom). inform all educational threatened glitches. There's no better way to make an impact than to become a knowledgeable person. Join the Justice Conglomerate! If there is no struggle, there is no progress. — Fredrick Douglass, Two Speeches: West India Emancipation.. And the Dred Scott Decision (Rochester, New York 1857). 5) Makes this a 14th Amendment Violation of the Constitution of the United States of America. 1-The equal protection claim arises under the 14th Amendment of the U.S. Constitution which is applicable to the states. 2-Then there is an equal protection claim that arises under Article 1, Section 7(a) of the California State Constitution. 3-The Title VI racial discrimination claim arises under the federal statute known as Title VI of the Civil Rights Act of 1964 (Title VI, 42 U.S.C. § 2000d et seq.). 4-The deceptive business practices arises under the state statute known as the California Consumer Legal Remedies Act, Cal. Civ. Code § 1780. 5- Common law claims of misrepresentation and fraud arise under state common law. 6- common law claims of false light. b) to have fun days to commemorate real black women warriors breaking barriers in their communities or careers from the 16th century to present day time period in America. If you are tired of women in general and blacks specifically having a negative imagery or lack of positive ones or being portrayed in media at higher rates than others, or being absent from movie roles, or the objectifying women or misogynistic lyrics or prejudice, pick your -isms, now we have a way to speak up and speak out! 3) Fashionably wear a T-shirt to show love for Queen Calafía and the black California women warriors. California is me! Any of the way you can help, helps us spread the word! Show your solidarity-Join Queen Calafía’s army!